We all know the feeling. You’re running late, grab your things and rush out of the house. Not a great start to the day. As if this weren’t enough stress, then there is an argument at work, you can’t take care of your tasks, and everything builds up. Not how you imagined the day going. Even on the way home, your thoughts buzz over your endless to-do list. The laundry needs to be done, the deadline for your project is approaching, you still need to buy a birthday present and a few bills have still not yet been paid. Your thoughts go round in circules – switching off isn’t a question. In the evening, you return home exhausted and worn out. At the very latest, now is the time to make time for yourself. It doesn’t matter how much is still to be done – now it’s your turn! With these 5 tricks, this isn’t hard at all. The important thing is that you truly make time for yourself, to relax, and that you set aside time – just as you do for other important tasks. Anyone who gets up half an hour earlier has a good chance of starting the day in a less stressful way. This half an hour is just for you, and you can do whatever does you good. You can make a cup of your favourite tea and leaf through a few magazines, exercise, take a walk around the block, or even cycle to work. A relaxed morning ensures that you begin the day with more energy and serenity, and that this feeling lasts. Sometimes all it takes is a good book and a quiet corner. Books can help you to immerse yourself in another world, and forget your worries and thoughts for a moment. They allow you to fantasise, dream and unwind. Before falling asleep, reading can help you to drift off more quickly and can even ward off nightmares. It’s worth a try, surely? A study has found that music helps us to reduce stress during everyday life. 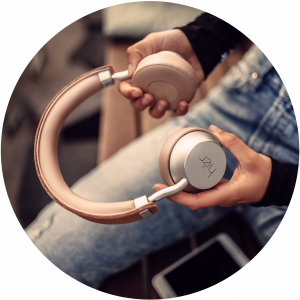 People who opt for music during times of stress have a lower cortisol level and are thus less stressed. If you consciously relax using music, it doesn’t matter what music you listen to – so don’t worry, it doesn’t need to be a Beethoven symphony. 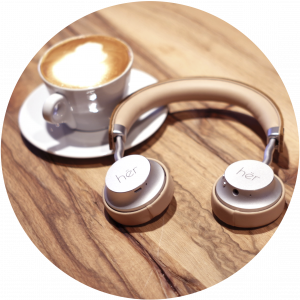 You can best appreciate your favourite music when you listen to it with hër on-ear headphones. Via Bluetooth, you can listen to music without cables and thus move around freely while you tune in. The most valuable time of all is the time we spend with family and good friends. Here, you can forget your worries and share your happiness. Whatever is on the agenda, these are people who simply love to listen to you. With your family and friends, you can be yourself – you don’t need to adjust yourself and are valued just as you are. If you are stressed and can’t relax, your favourite people are there for you and will help to bring you relief. Gratitude is the key to a happier and more carefree everyday life. Every day, write down the things that you are grateful for. Count three things that have made you truly happy – and make these as concrete as possible. Who did you meet? For whom did you do a favour? Who did a favour for you? What did you experience? What things did you discover? Who or what brought a smile to your face? Once you have answered these questions, you will recognise that the day was full of wonderful moments, which you had almost already forgotten. With a few simple tricks, you can consciously withdraw from the stresses of every day life. It is important that you make enough time for these relaxation techniques, so that you remain fit, healthy and happy long-term.